Home General Going Through a Potential Divorce? In North Carolina, we have a no-fault divorce law which essentially means that you need to be living separate and apart for a year (i.e. living in separate residences). Just because there is an attempt to reconcile briefly or you stay temporarily at the other’s home does not necessarily restart the year time frame. In our state, you can be actually separated (lived apart for one year), have a separation agreement (establishing the date of separation), or have a judicial declaration that you are separated. In any event, all of these issues are often emotional and difficult to handle, but our attorneys at the Mast law firm are here to help and guide you through this process. It may be and can be extended process, but we’ll be with you the entire step of the way. If a resolution through a separation agreement cannot be reached, which can be the most efficient and cost-effective way of handling a separation, a lawsuit may be required to be filed with the courts. Before meeting with us, you may wish to gather as much information as you can obtain regarding your families assets, debts, finances, etc. If you need assistance with any of the above issues, please give us a call and we should be able to provide some helpful guidance as to key documents and other information that will be desirable. 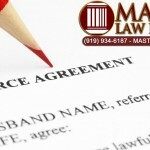 This article was written by attorney Ron Trimyer, feel free to email me at ron@mastfirm.com.